Are you searching for luxury and a spacious environment? You found it here! This exclusive holiday villa in a top location is equipped with a lot of comfort, surrounded by an illuminated tropical garden, a large lit pool (installed round bench and table), an elegant terrace from you which you can experience an unforgettable sunset. You can enjoy this natural play from the hot whirl pool (76 jets). The bedroom: Champagne, Asia and Junior suite (2m x 2m beds) and the bathrooms are spacious and exclusive so that all residents have the same amount of comfort. Ceiling height in these areas = 3 meters 4 TV and DVD (international material possible) in all bedrooms. The 100 m2 residence hall (ceiling height 5.50 meters) offers these possibilities on a large screen. You can listen to music throughout the entire house and pool area. Fast, free internet access (W-LAN), wireless, 2.4 GHZ. You are renting from the owner! Luxury in paradise:: Do you want to be active? Dive, swim, sail, cycle, fish, horse riding, surfing, water skiing, paragliding, tennis and gold, gold and more golf: Cape Coral has 3 golf courses: Royal Tee Country Club at Cape Royal (27 holes), Coral Oaks Golf Club and Store Marina & Golf (27 holes) and another 50 of all difficulties. Enjoy a day on the water, for example, with a captain on a 'Sea Ray 41 Express Cruiser'. Price on request. A rental boat (22 ft) -without captain - short term availability. Price on request. Be on the 'Easy Rider' on a Harley Davidson Soft Tail Springer! Price on request. All 'equipment' for this luxury are available at all times. We have a free fishing set for your attempt to make your stay cheaper. A villa in Florida Style on a wide canal in a southern location; spacious pool area (including hot whirlpool) before the background of illuminated palm trees. Very short path to the river without locks. If you want to experience an unforgettable sundowners directly by the river, we recommend this tasteful and exclusively furnished villa. The house offers a large pool. The atmosphere directly on the Caloosa - hatchee River in a southern position is unforgettable. The villa is rented with a boat. Both villas are rented directly from the owner! Pool: The pool from Sunset Paradise works without chlorine. You always have crystal-clear water with drinking water quality. A computer monitors the water quality and controls the conservation. The weekly pool service of most houses with high amounts of Chlorine is not necessary for the Sunset Paradise. You can enjoy soft water! Red eyes and irritation through too many chemicals does not occur by us. A lot of fun in paradise. The bathrooms are painted with pastel colours, the bathroom 1 has a whirlpool bathtub and separate WC. A large shower as well. The shower bathrooms 2 and 3 are spacious and well-lit. Each with WC. We don't like colourful wallpaper in the bathrooms! All bathrooms have 2 sinks and a very large mirror. The guests of room 2 and 3 do not feel disadvantaged. The showers are all large and more comfortable. During the morning, a lit sky in all bathrooms awakes you and brings you a good feeling. Music from the central system in the house, can be turned on and controlled from all rooms. The equipment of the 115 m2 and 5.50 m high residence hall is a combination of antiques and modern furniture. Real carpets and images emphasize the exclusiveness of this through the large window wall and light-flooded rooms. With the available porcelain and the corresponding glasses, you can treat at least 20 guests, for example, on the large terrace with a built-in electrical grill station. 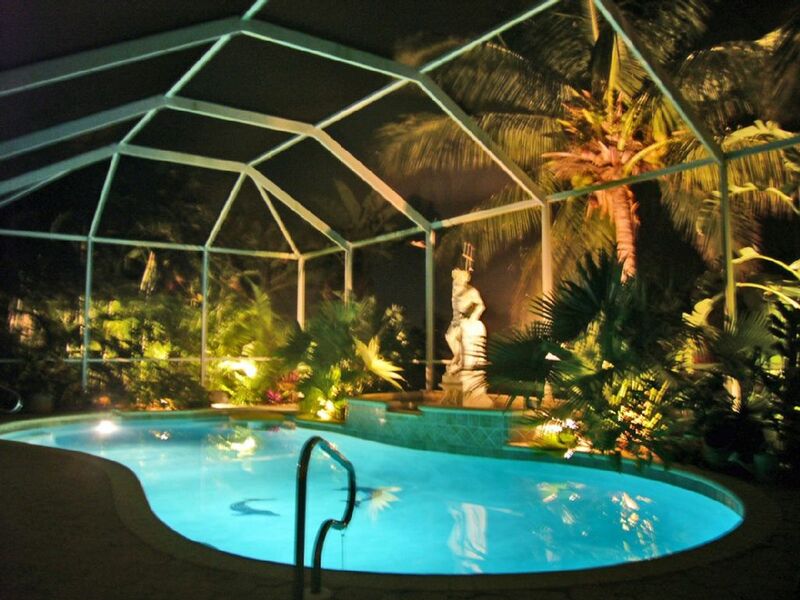 Enjoy the sunset and the illuminated pool area / tropical garden. Furthermore, you can enjoy a diverse image gallery from the artist Petrick, a master student from the Düsseldorf Art Academy. These can also be purchased. If you are interested in a different house, we would like to refer you to the White House and Blie Dolphin in the text following this Fewo information. All 3 houses are rented by the owners. No uninterested agents who just want to make a profit. We place value on a sophisticated standard of life, just like you! We rented the villa and the boat for a week, it was amazing. Very nice villa, well equipped and located in a nice quiet neighborhood...just the way we like! Enrico the manager of the property was also very nice and helpful. Thanks for the nice vacation. When we arrived all we could say was "Wow!" The house was spotless and each bedroom has its own bathroom which is great when with other couples. The pool and patio was set up so nicely that we ate ALL meals outside! This is a great getaway and will definitely use again. I stayed here with my girlfriend and my kids. The place is VERY spacious was clean and had everything that we needed to stay here. We Really enjoyed the hot tub and the fact that it was separated from the pool allowed us to be able to have the temperature up high and enjoy the relaxing temperatures and jets. If the pool could have been a little warmer we would have enjoyed it more. I would definitely recommend and rent this place again. The pool has a electric heater and then, if you need with payment for power, do you have the perfect temperature. Peter D.Düsseldorf / Cape Coral FL. Sehr schöne Einrichtung und perfekt für Boater mit kurzer Anbindung zum River ohne Schleuse. Wir haben im „Sunset Paradise“ drei traumhaft schöne, erholsame Urlaubswochen verbracht. Die Villa ist herrlich ruhig gelegen und dennoch ist man in wenigen Autominuten auf der Hauptstraße und mitten im Getümmel. Die Villa „Sunset Paradise“ ist ein exklusives und komfortabel ausgestattetes Domizil mit sehr viel Privatsphäre, in dem es an Nichts fehlt. Sie ist sehr geschmackvoll eingerichtet und wird mit viel Enthusiasmus instand gehalten und gepflegt. Die Sonnenuntergänge sind legendär – eben „Sunset Paradise“! Unsere Ausflüge mit dem Boot, das man auf alle Fälle - wenigstens für ein paar Tage - mieten sollte, werden uns immer unvergesslich bleiben. Man lernt Florida zu Boot auf eine ganz neue Art kennen und lieben. Delphinsichtungen waren - zumindest bei uns - an der Tagesordnung! Dank der guten Lage des Hauses ist man in kürzester Zeit auf dem Caloosahatchee River und dem Golf. Das Highlight des Urlaubes war natürlich die Ausfahrt mit der „Beautiful Life“. Tausend Dank Captain Pitt! Der Kontakt von Deutschland aus und auch die Betreuung vor Ort durch den Verwalter Enrico sowie den Eigentümer waren außerordentlich freundlich und herzlich sowie überaus hilfsbereit. Nachdem uns nun der Alltag wieder eingeholt hat, denken wir gerne an diese schöne Zeit zurück und freuen uns schon jetzt auf den nächsten Urlaub in dieser „exklusiven Oase der Ruhe“. The area of Savona is one of the safest residential regions. Cape Coral has a healthy climate, which is even comfortable during the summer months due to being close to the Gulf. You can drive directly from your house by boat onto the Intercoastal Waterway on the East coast and further to the Bahamas. A short boat trip to the lunch or dinner in one of the countless restaurants is the alternative. More than 40 parks and lakes invite you to have a picnic and relax. All shopping and outlet centres leave nothing to be desired. The daily needs can be covered by the supermarkets and the 'German bakery'. A row of international restaurants bring more quality to life in Cape Coral: The assortment of fresh seafood does not only excite the pampered steak lovers: a diverse selection of fruit and wine can be found everywhere. The following applies for each relationship: 'Pampered by the sun in the Sunshine State of Florida'. The villa is located on a very wide channel with a lot of 'privacy'. Golf: We have a very good overview of the 130 golf courses that are located in southwest Florida. We differentiate between private, semi-private and public. The addresses and the locations of the courses can be seen here. In order to make the orientation easier, you can rent a GPS from our management for $ 4 per day. Take a Hummer H2 through paradise. Rental according to availability. During the morning go golfing, enjoy the afternoon by the Gulf of Mexico, with a boat from our partner. We offer a free golf bag for your training and also can help you get an affordable teacher. We never had such a good analyst!! Do you want to go with your friends or family with a yacht for a day - 41 ft Sea Ray (with captain) brings you to the most beautiful islands and bays. You can drive yourself if you'd like. Do you prefer the ultimate thrill of a Harley Davidson?? No problem, everything is possible. Ski: •Additional price information: Included in the price: Bedsheets, towels, hair dryer and hair styler, multiple safes for your safety, American cell phone (prepaid) 64 DVDs in German , telephone conversation in Cape Coral and in the nearby area, DSL High Speed Internet access without costs. Pool heating (solar powered), pool and garden service and water and sewage. On site you will be taken care of by our German-speaking management service. Upon arrival, you will receive a house instruction. Also questions about your destination, for example, restaurants, shopping or sightseeing tours, will be answered by the house management. Written informational material can be found in the house as well. The electric pool heating is charged with your electricity bill. In dem Betrag ist die Floridasteuer von 11 % enthalten. Die angebotenen Boot, Harley Davidson und Hummer H 2 sind nicht im Mietpreis includiert. Der Strom wird nach Zaehler mit 15 cent/ kwh abgerechnet. Die Kaution fuer das Haus betraegt 800,00 $. Endreinigung 150.00 $ Der Mietpreis gilt für 2 Personen, jede weitere Person 100.00 $ pro Woche.